Top beauty schools give students opportunities for hands-on experience. 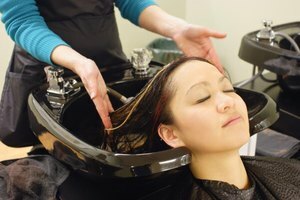 Cosmetologists perform haircuts and even alter the color or texture of hair using color and perm chemicals. Candidates must pass a state board exam before earning a license. Cosmetology schools prepare students to pass the exam and enter the field. Potential students need to research ahead of time to ensure the schools provide hands-on training in a salon, business training, accreditation and instructors active in the industry. Aveda is a prestigious brand of hair products, and Aveda Institute offers cosmetology training. People know the brand as eco-friendly, and Aveda carries this philosophy into their institute. One of the largest organic ingredients purchasers, Aveda's view on beauty includes nutrition, health and wellness, and body care. Additionally, students have opportunities to intern with top beauty product makers and learn cutting-edge techniques. Internationally renowned, Aveda Institute offers 59 locations in the United States, Canada, Australia and Korea. Paul Mitchell is known as an elite hairstylist who then furthered his fame with a line of salons and products. With locations across the United States, the Paul Mitchell program works in three phases. Students learn cosmetology foundations such as cutting and styling in the core phase; communication and retailing in the adaptive phase; and advanced hairdressing and chemical work in the creative phase. In addition to hair cutting and styling, students learn basic facials, makeup, manicuring, pedicuring and fashion trends. Marinello offers a century's worth of experience in the beauty field. Founded by the innovative Ruth Maurer, who attempted to craft products over her gas range, the Marinello Schools still work to revolutionize beauty products. Students receive classroom training as needed, but the majority of their learning comes through hands-on interaction with salon guests. The program includes technical instruction in hair cutting, coloring and styling, as well as skin care, makeup and nail care. Students also receive instruction in salon management and passing the state board exam. Toni & Guy started as a single salon in 1963, but today the brand is an industry leader in beauty education, fashion and innovation. Salon employers state that graduates consistently produce results in cutting and styling, business-building and customer service. Students receive 350 to 400 class hours of instruction, hands-on practice in dispensing chemicals and on a salon floor, and preparation for taking the state board exam. Instructors also emphasize career building in addition to hairdressing. Toni & Guy Academy has 24 locations nationwide. A United Kingdom original, Sassoon now has academies in the United States, Canada and Germany. Students learn to cut and color "the Sassoon way," using methods proprietary to the brand. Instruction focuses on the practice of these techniques with the goal of crafting hairstyles to accentuate face shape. Sassoon Academy emphasizes individuality and creativity, encouraging students to experiment later in their training. Graduates find jobs on movie sets, magazine photo sets and within the fashion industry in addition to running their own salons. Archuleta, Nadia. "Top Five Cosmetology Schools." Synonym, https://classroom.synonym.com/top-5-cosmetology-schools-16891.html. 26 September 2017.